In order to use SSL, you must check that SSL is installed and ready to use. If the output is $true, then SSL is installed, if $false, then you need to install ssl. Note: mIRC 7.35 and newer versions include SSL by default. In order to use SSL, you need OpenSSL installed. Exit mIRC (This is required). 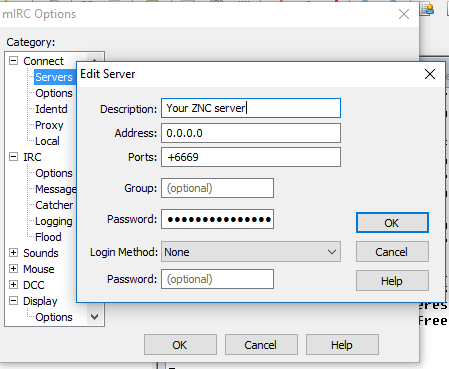 Connecting to ZNC, with MIRC without having to provide logon details every single time or re-connect. This way MIRC will automatically authenticate with ZNC without /quote pass. If port 6697 is the SSL port, you need to specify the "+" before the port. This is a failed attempt due to not specifying the "+"
This is for plain non-ssl connections. This page was last edited on 30 March 2019, at 02:13.